Vermont has no shortage of good local bread — from the sliced sesame wheat loaves from Shelburne’s O Bread, to the jalapeño-cheddar rolls from Burlington’s August First, to the crusty baguettes from Middlesex’s Red Hen Baking Co. With such a bounty nearby, I’ve never felt compelled to bake bread at home. 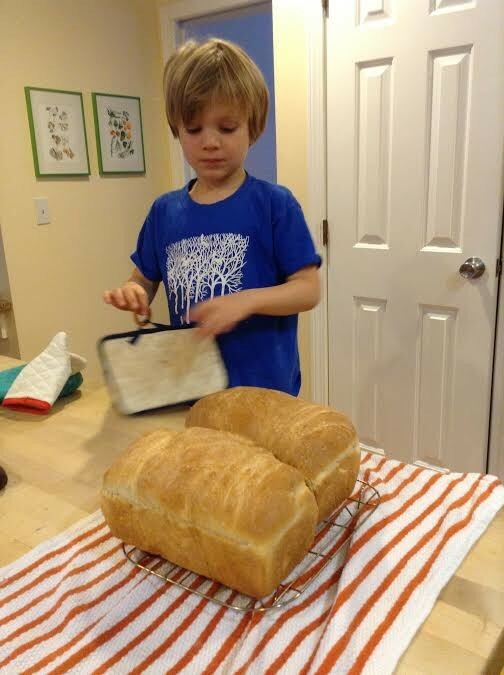 But on a recent rainy, icy morning, when getting out of the house with a three-year-old seemed like an insurmountable task, my son, Theo, and I decided to give bread baking a whirl. Theo happily punching the dough. We used a recipe called “A Child’s First Bread” from a new cookbook, Sylvia’s Table by Liz Neumark with Carole Lalli. 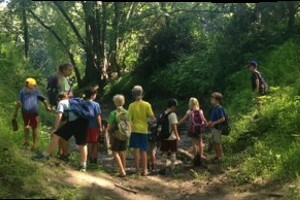 After Neumark’s youngest daughter died just before her seventh birthday, the mom of three other children bought a farm and established the Sylvia Center — a non-profit that teaches kids in New York City and the Hudson Valley how to make fresh, healthy food. Sylvia’s Table isn’t a kids’ cookbook per se, but it includes many family-friendly recipes inspired by the Sylvia Center's work. Theo and I got started by mixing together yeast, sugar, warm water and bread flour, then letting it sit for 10 minutes until it began to bubble. Theo had never encountered yeast before, so we watched a couple of YouTube videos about how the fungus does its job. Theo really understood — and wasn’t grossed out by — the concept that yeast is alive, a little organism that greedily eats up sugar and then burps out carbon dioxide, which creates the air bubbles that make bread fluffy. Stage two required adding the remainder of the flour to the bubbly mixture we’d created, and then kneading the dough for about 10 minutes. I’m not sure Theo ever mastered the recommended kneading technique of pushing the dough away with the heel of the hand and turning it back over itself, but he sure did have fun manhandling the big lump of dough. We covered the bowl of dough with a damp towel and put it aside to rise for an hour. We used the downtime to dramatize the yeast-fermentation process: I played the role of the yeast and chased Theo, playing the sugar, around the house, threatening to catch him and eat him. Then, inspired by the bubbles the yeast creates, we did some more kitchen chemistry, combining baking soda and vinegar in a container until it foamed over like a volcano onto the already-messy countertop. Finally, we made some honey butter, blending up a stick of butter with a quarter cup of honey in our KitchenAid mixer. When the hour had passed, Theo was amazed to see that the dough had doubled in size, nearly overflowing from the bowl. 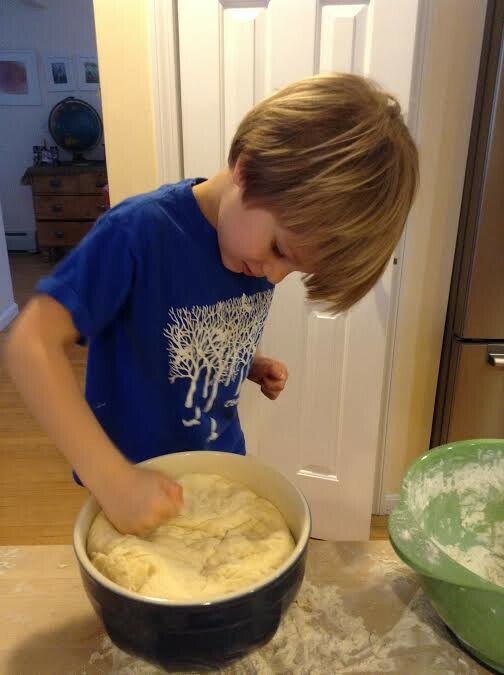 He was equally enthralled with punching the dough until it deflated. We divided the dough into two parts, kneaded each ball a bit more, then put them in two oiled loaf pans. Forty more minutes of rising time was followed by 30 minutes in the oven. We probably prolonged the cooking time a bit by opening the oven door several times just to get a few whiffs. The two loaves that emerged were just as I'd hoped they would be, perfectly shaped and golden. It was hard to wait the suggested hour for them to cool, but we restrained ourselves. By lunchtime, we had warm slices slicked with honey butter to accompany leftover chili. They were crusty on the outside and soft and pillowy on the inside, a time-intensive but totally-worth-it treat. Mix together the yeast, sugar and water in a large bowl. Add two cups of the flour, then stir in the salt and butter. Set the bowl in a warm spot for about 10 minutes, until the mixture is foaming. Add the remaining flour, half a cup at a time, mixing well after each addition. When the dough begins to form a mass and pull away from the sides of the bowl, turn it out onto a lightly floured surface. Knead the dough until it is smooth and elastic, eight to 10 minutes. Lightly coat a large bowl with oil. Place the dough in the bowl and turn to coat it lightly all over. Cover the bowl with a clean, damp cloth and set it in a warm, draft-free place until the dough is doubled in volume, about one hour. Lightly oil two 9-by-5-inch loaf pans. Deflate the dough by punching it down with your fist, then turn it out onto a lightly floured surface. Knead the dough lightly again, just a few turns, and divide it into two equal pieces. Form each piece into a loaf the length and width of the pans and pinch the underside together to form a seam. Fit the loaves into the pans, seam side down, and cover them with the damp cloth. Let the loaves rise until doubled in size, about 40 minutes. When the loaves are ready, place them in the oven, lower the heat to 375 degrees, and bake for about 30 minutes, or until the tops are golden brown. Turn the loaves out onto baking racks and let cool one hour.